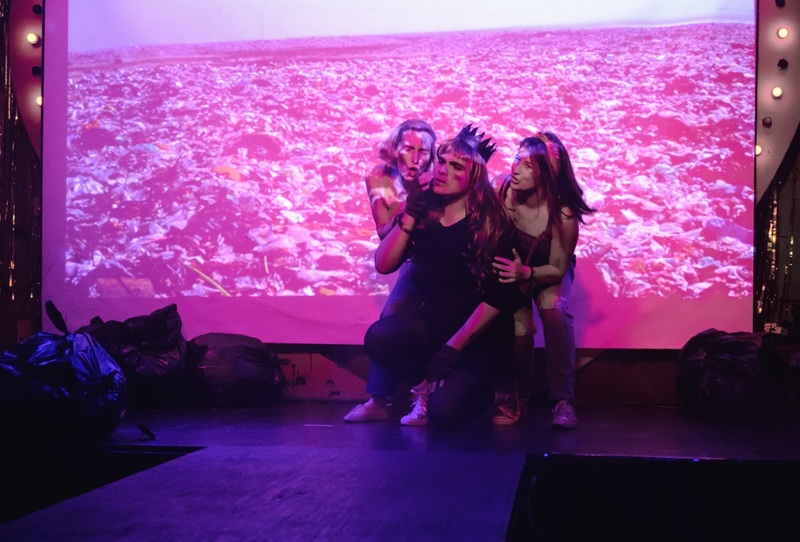 MFA Fine Art first year student and performance artist, Antonis Sideras recently exhibited his performance piece ‘Maria la del Barrio’ at art exhibition and club night ‘Deep Trash – Royal Trash’ at the Bethnal Green Working Men’s Club. We spoke to Antonis about the performance piece, inspired by a childhood love of telenovelas, his live art practice and what he’s enjoying most about studying the MFA at Wimbledon. Can you talk about the performance piece and the inspiration behind it? The performance piece is called ‘Maria la del Barrio’ which translates to ‘Maria of the ghetto’. The performance is me revisiting my favourite telenovela. In Cyprus where I grew up, as in many other smaller countries, we get a lot of telenovelas from Mexico, Brazil, Peru and other places in South America. They have voice overs and we watch them in Greek and you see the horrible thing of the lips not matching up with the dialogue! Growing up, I would always watch these telenovelas and Maria la del Barrio was one of my favourites. Maria la del Barrio was about a 15-year-old Mexican girl who lives in Mexico City; she’s poor, she lives with her godmother and she has a job picking up garbage. The whole telenovela is about her falling in love with this handsome, young heir to one of the richest families in Mexico City. They sort of get together, but then this evil woman appears who wants to marry him for his money and she pretends to be pregnant, so all this drama unfolds. The performance looks at gender and class stereotyping within that genre. It’s kind of spoofing it but in an uplifting way. How did you become involved in the Royal Trash event? I discovered the open call for this event called Royal Trash and they listed some sort of themes that they wanted people to explore, and I saw they had listed ‘contemporary soap operas’. That’s where the idea popped into my mind. 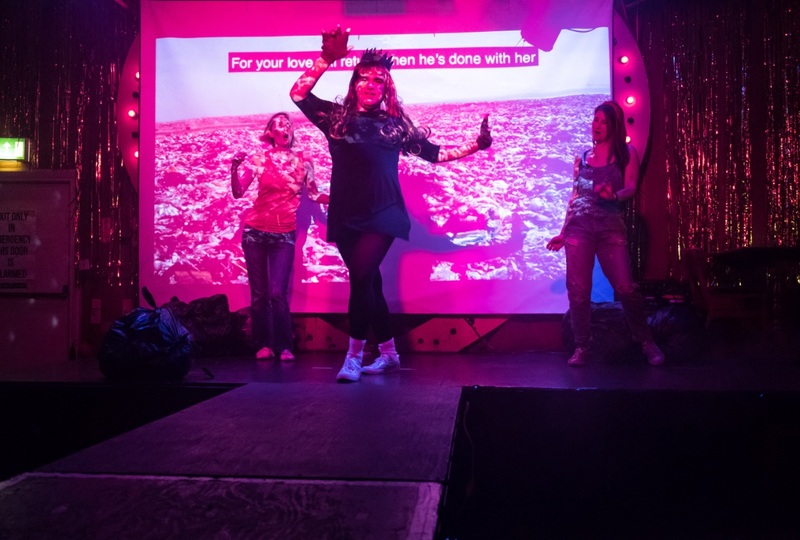 Deep Trash is an exhibition, performance and club night and it has different iterations, usually twice a year. They usually have an open call for submissions where you have to write a proposal outlining what you’re intending to do, talking a bit about the research you’ve done and what sort of context you’d like to put the piece in. You also send some images of your work. For Royal Trash, Deep Trash received some funding from Arts Council England and they also have representatives from the Live Art Development Agency working on the event, which is a big deal. I was shocked to have found out that they selected my performance to be featured. How would you describe your practice and how has it developed over the course of the MFA so far? Before I came to Wimbledon, I was studying illustration and visual communication and I was already doing a lot of performative work. I would use my body in photography, collage and video and I would make performative works. When I graduated, I had a year off from studying where I began exploring more live art as a craft in itself. Ever since I’ve come to Wimbledon, I have been going back to my roots as a performer so I am looking at performance art, parody and being political but mostly just using what Mother Nature gave me! I’m a very extroverted person, I’m quite bubbly and I like making fun of things so I think I am a natural performer in that sense. The first thing that comes to mind is the other students. They are so incredible! We are such a tight year and the trust that we’ve developed is amazing. It’s great to watch your own practice develop alongside other peoples’ practice. We also have some very good facilities here at Wimbledon! What made you want to do an MFA Fine Art? In the future I’d maybe like to teach art at university level and I know having an MFA is really helpful in being able to do that. The reason I wanted to study the MFA Fine Art at Wimbledon specifically is that it’s very professionally driven. There’s a lot of teaching that’s about entering the London arts scene, so for me that was great. I also like Wimbledon because it has both fine art and theatre courses here and that’s the sort of environment I like to be in. And we’re a bit smaller, a bit quieter and you get to know people really easily. I just showed my work in Life in a Shoebox with the other MFA students. Me and a group of four other students are doing a group show at the Stanley Picker gallery called ‘Static’ that opened on 10 May and then I’m also performing at Fringe Arts Bath at the end of May in a performance called ‘Corpus Christie’. The performance is about the ephemerality of life and also looks at moments of change. It is a collection of poems from myself and also from my favourite Greek poet Cavafy. Both of the poems I have chosen are talking about mindfulness and being in the present but they also get a bit more philosophical about life. There’s this dialogue between myself and him as a poet that will be performed. The poems were originally in Greek and I’ve translated them, and I wrote my own poetry in English. You can find out more about Antonis and his work by visiting his website and following him on Instagram.